With 10 bright colors, the set is ideal for rhythmic gymnastics dances. 1 piece in rainbow color, 9 pieces are in pure colors: red, orange, pink, green, blue, yellow, purple, rose red, dark green. This product is suitable for preschool kids, children, and adults. SIZE: the rhythm ribbon is about 78.7 x 1.8 inches (L x W), the rod has a length of approx. 12 inches. 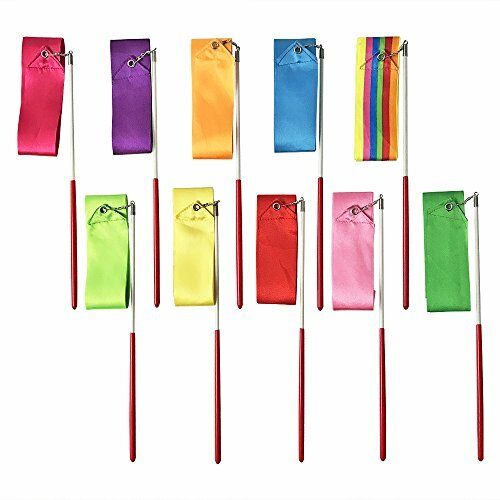 PACKAGE: 10 pieces gymnastics ribbons of 10 colors, rainbow color, red, orange, pink, green, blue, yellow, purple, rose red, and dark green. MATERIAL: The ribbon is made of soft silk. The rod is made of fiberglass, with the red plastic coating handle. VERSATILE: ideal for rotating baton, artistic gymnastics, art dance, physical training, circus and so on. There is a metal clasp on the top of rod. You can change out the ribbon on the rod. PERFECT GIFT: Charming for dance and gymnastics also can be used as kids gifts, decoration of festival, party. If you have any questions about this product by PiPiHa, contact us by completing and submitting the form below. If you are looking for a specif part number, please include it with your message.